Giant Telecom Company BSNL has announced the launch of new Unlimited Combo plan with 4Mbps speed under Broadband services in all Telecom Circles. 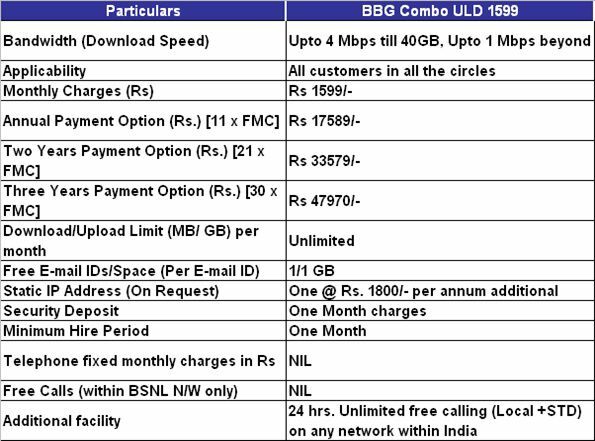 State run Telecom Company Bharat Sanchar Nigam Limited (BSNL) on promotional basis introduced new BBG Combo ULD 1599 Unlimited Broadband FMC plan which offers maximum download speed of 4Mbps with 24hrs Unlimited free voice calls to any network for both Local/STD in India from 17th November, 2016 onwards. As per latest information, BSNL corporate competent authority despite existing unlimited broadband plans introduced another plan to make unlimited voice calls to any network numbers through this newly launched BBG Combo ULD 1599 plan. Customers who subscribed to this plan can experience Unlimited download/upload data usage upto 4Mbps with 24 hours unlimited calls to any numbers i.e On-net and Off-net. This promotional plan comes with FMC (Fixed monthly charges) of Rs.1599/- with Annual (11xFMC) Rs.17589/- , Two years (21xFMC) Rs.33579/- and Three years (30xFMC) Rs.47970/- payment option. BSNL will collect one month FMC charges against Security deposit from customers who subscribe to this plan. In addition to the above customer will get One Static IP address (on request) @ Rs.1800/- per annum which is additional. New BB plan will be available for all new as well existing customers in all telecom circle customers from 17-11-2016 onwards. The above new promotional Broadband plan will be implemented with effect from 17th November, 2016 and available for a period of 90 days from the date of launch in all Telecom circles.